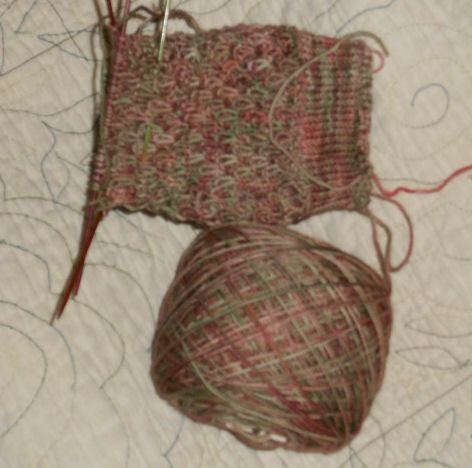 What’s on the needles today — well a little bit more progress has been made on the latest pair of socks – Honey Dew. I really am liking that yarn. I also knit the swatch for the Greta pattern – which was my Camp Loopy 2 project. I knit rather loose so tried knitting the swatch with a needle one size smaller than the directions called for but the gauge wasn’t right so ordered a new needle. In the meantime I just wasn’t sure I’d like the the yarn and have now decided not to make that pattern. The yarn I got is not drapey enough and I knit about a half ball of yarn trying to decide how it would look and seriously I wonder if the yardage is correct in that pattern for the size I was making. For the final version I would have been using a size larger needle (hence using more yarn) and it just didn’t look like the there could possible be enough yarn. I still like that pattern, and will make it later from some nice drapey yarn – but I’ll be making sure I buy extra. So now I’ve settled on the Four Seasons Vine Lace Vest by Cecily Glowik – she has so many really cute little sweater patterns that I just love. This is just a little waist length vest with a pretty lace design in it. I swatched that and all looks good so now to get the rest of the yarn wound and then await June 27th to begin Camp Loopy 2. Speaking of the Loopy Ewe 🙂 a box from them arrived today (I had free frequent shopper money with them I NEEDED to spend) so needles I ordered for Greata pattern arrived (and I also need them for the new Camp Loopy project) and I ordered yarn to make a second Spectra scarf — a very bright one so stay tuned and I’ll show you the yarns tomorrow.